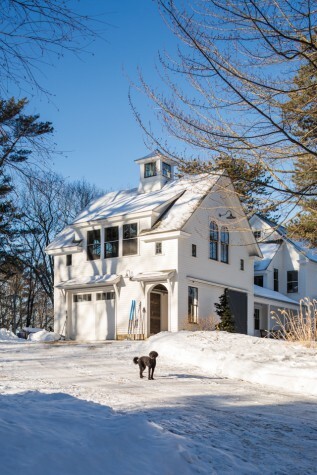 Designer Hans Warner remodeled the home’s existing 24- by 24-foot garage (above, left). For budgetary reasons, the team needed to keep the foundations of the old structure. “At that point it became more of an experiment in how far could we push the geometry to generate something that truly had barn- like proportions,” he says. The first floor contains a garage and entrance passage to the front door, and above it there is a bunkroom for visiting children. 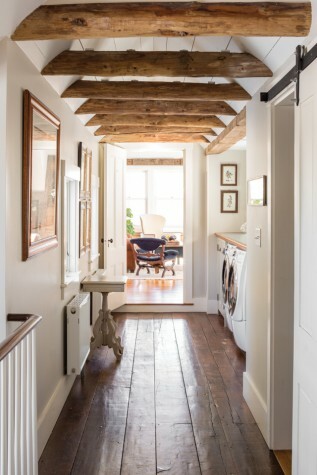 Spang Builders reused materials throughout the home, such as these wooden ceiling beams (opposite) in the laundry area. 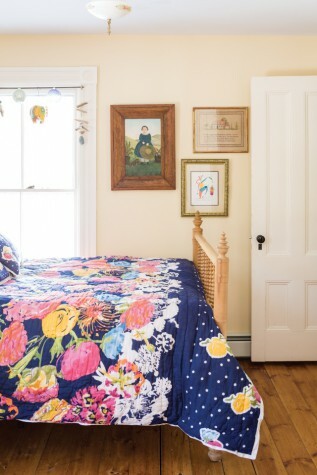 Missy and Frank's daughter's bedroom. 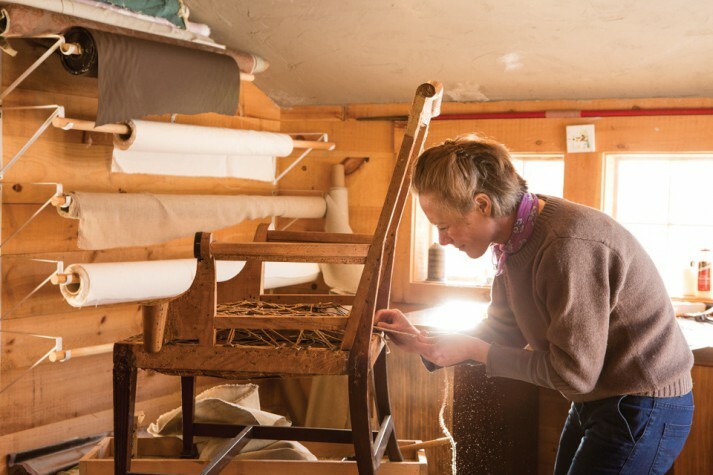 Missy McDougald (above), a specialist in the conservation and restoration of upholstered furniture, works in her shop. For her own home, it was imperative that as many building materials as possible be reused. 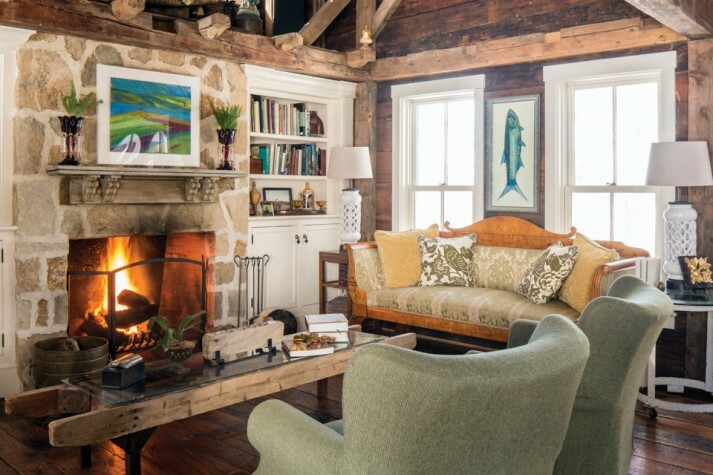 This New England–style farmhouse in Kennebunkport was once the home of the captain of writer Booth Tarkington’s schooner. It is now the home of Missy and Frank McDougald and their family, who renovated it with the help of Spang Builders and architectural designer Hans Warner. 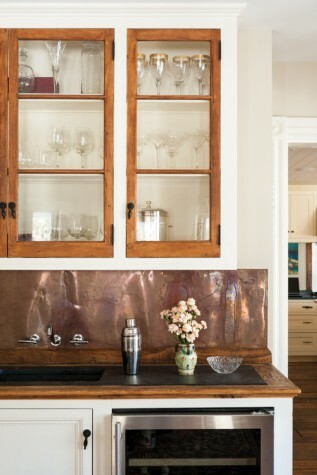 A copper backsplash in the bar. A corner of the “barn room”, which was rebuilt piece by piece from a barn that was being dismantled around the corner from the house. 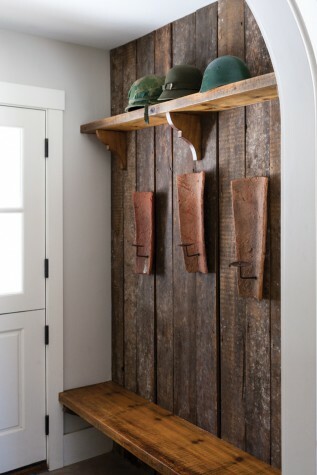 Reused beams in the mudroom. 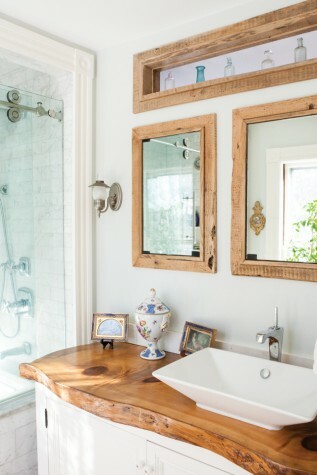 In the owners’ bath, a large slab of pine works as a countertop. 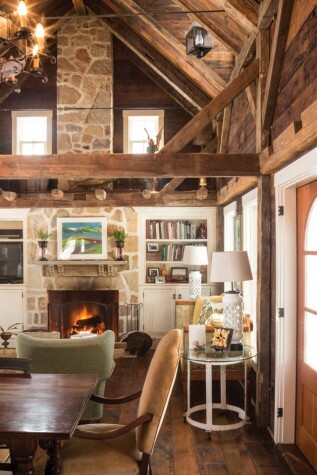 Spang Builders dismantled a nearby barn that was being torn down and rebuilt it, piece by piece, into a living/dining area designed by Hans Warner. “I wanted it to feel like it was there for a long time and a part of the original foundation,” says homeowner Missy McDougald. 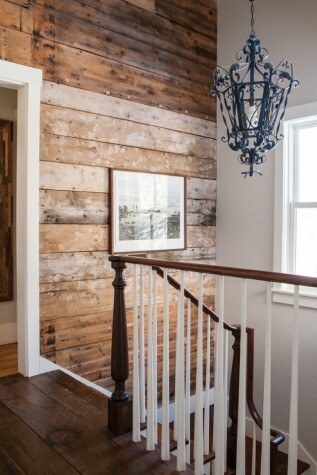 Ample wood, tall ceilings, and posts set the stage for simple furnishings that complement a rustic feel. 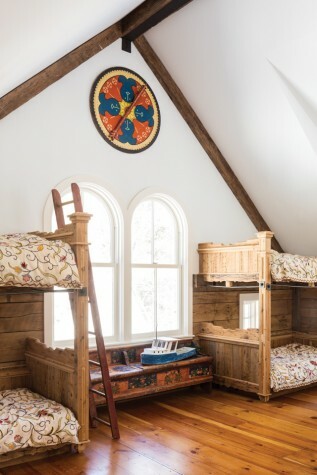 The “bonus room” above the garage (opposite) features custom bunk beds built by Spang Builders. 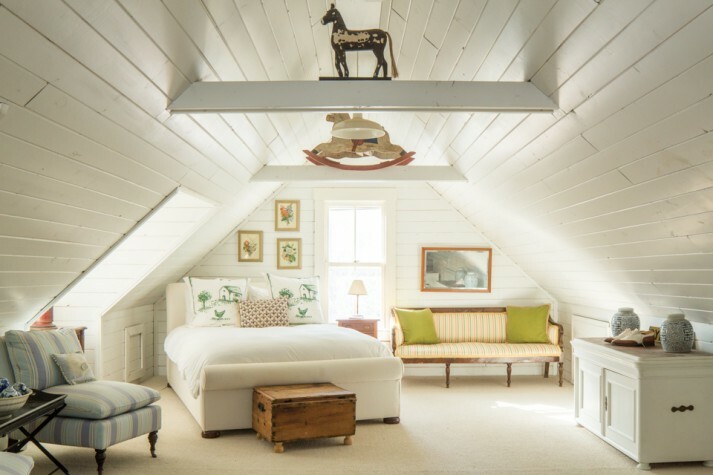 A whitewashed guest bedroom in a refinished attic space. When Frank and Missy McDougald made the decision to move to Maine, they were living in Boston’s South End with their two-year-old daughter, Mae Larue, and awaiting the birth of their second child, Frank McDougald IV. 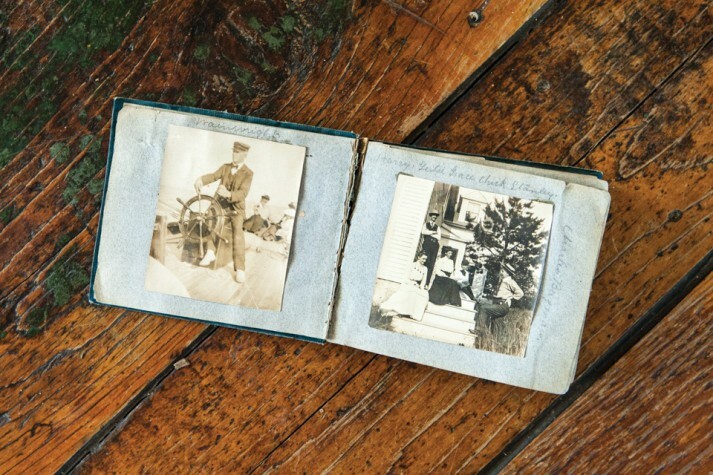 Happy memories played a part: Frank’s father had spent his childhood summering in Kennebunkport and, as an adult, took his family of six there every summer, packing up the car at the start of August and making the drive up from the farmlands of New Jersey. Missy had grown up on the surfing shores of New Jersey herself, and was raised to turn to the ocean for healing and spiritual renewal. She and Frank wanted the same for their children. 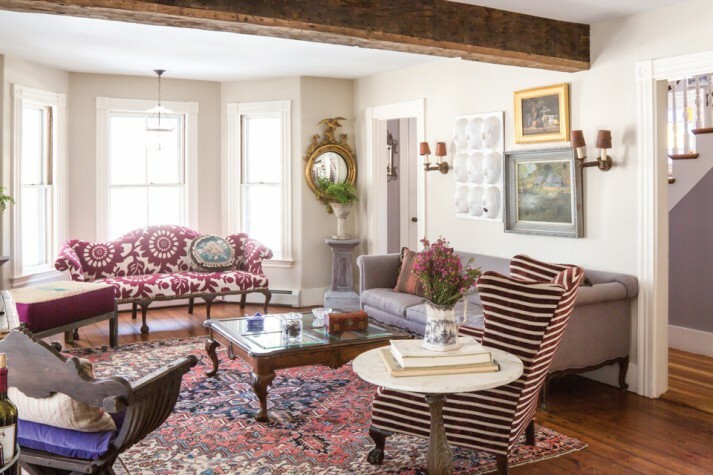 The couple began looking in Kennebunkport, where they eventually found a New England–style farmhouse that was originally built for a local sea captain who was responsible for writer Booth Tarkington’s schooner. “It had beautiful bones and a wonderful history,” says Missy. 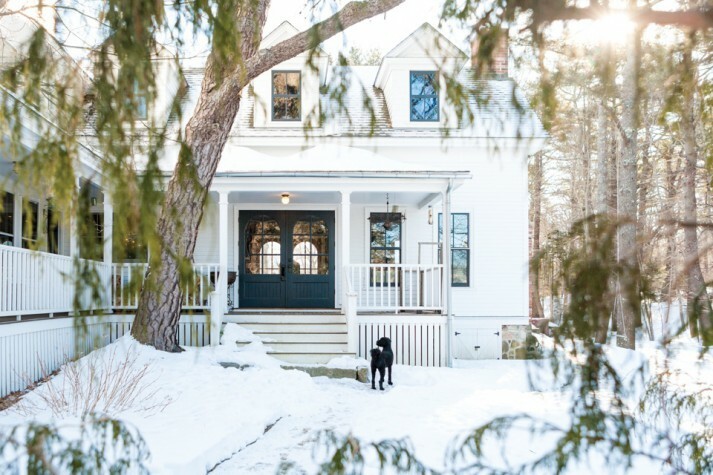 (In fact, all of the homes on the surrounding land had belonged to Tarkington’s staff— behind this property is an Adirondack house that was the home of Tarkington’s chef, and at the end of the driveway is what was once the chauffeur’s house.) The McDougalds hustled to make a bid, and with a bout of luck, the house became theirs. Shortly after they moved in, they met their first local family, Hans and Lee Warner, and made a bittersweet discovery: the Warners had put a bid on the same house that day. The two couples became fast friends, and a few years later, when the McDougalds were looking to renovate, they called Hans, an architectural designer, to do the work. “While I may have lost the bid on the house, I got the job,” says Warner. And with it, he got an opportunity to work with great friends and execute a set of design ideas that he had originally planned for his own home. With their team lined up, Missy and Frank identified their wish list. 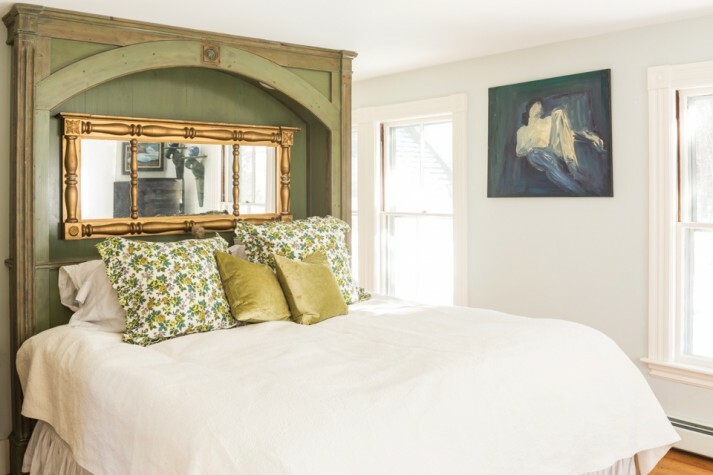 Their immediate need was, of course, to accommodate their growing family, but they also wanted guest space to house the procession of visitors who came to Maine every summer. “Not only was bed space at a premium,” says Warner, “but the existing house was broken up into a series of small, compartmentalized rooms, not ideal for entertaining or for a large family and visiting friends.” The renovations would include not only expanded bedroom space but also a larger kitchen and living space with a fireplace, and a large outdoor terrace for entertaining. (“If you’re lucky enough to get invited to one of Missy and Frank’s social gatherings,” advises Warner, “be prepared for one of the best parties in town.”) The need for a good flow led to a more modern plan that would allow openness and natural adjacencies to occur “unencumbered by the traditional methods of room- making in historic New England,” says Warner. 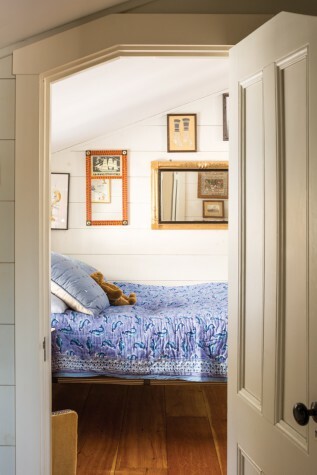 The renovation also included the addition of a garage with a bonus family room above, and a complete remodel of the master bedroom, bath, and a custom closet area, as well as the addition of a barn space to make room for a kitchen, dining, and living area. In addition, Missy—a specialist in the conservation and restoration of upholstered furniture—was interested in a crafts room to work on her projects. 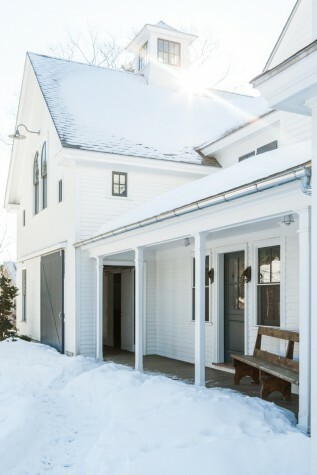 Perhaps the most notable change to the house was the addition of the barn. Early on in the design phase, it was determined that some sort of two-story space was in order to relieve the compactness of the existing structure. Through the help of Frank and Missy’s friend Louise Hurlbutt of Hurlbutt Designs, they found an old barn that was being torn down around the corner. 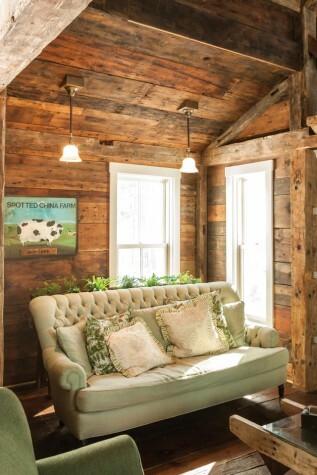 Spang’s team dismantled it piece by piece and reassembled it to create the living room, a nod to the majestic barn on the farm Frank grew up on (and that was featured on the cover of the book Barn by Elric Endersby, David Larkin, and Alexander Greenwood). 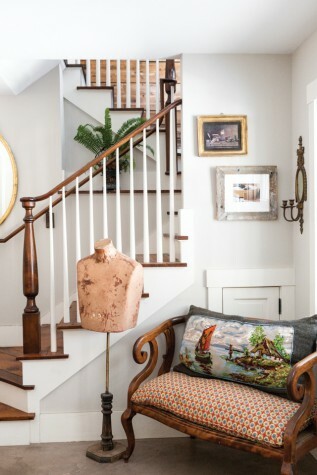 This two-story space not only became the McDougald’s new living and dining room, but it became their entertaining area and established the new aesthetic core of the house. Although the purchase of the barn was “a bold move,” according to Spang (they had to send it to a specialized abatement facility to eradicate powderpost beetles, which can compromise the integrity and strength of an old structure), “it provided the team with a palette of recycled materials that were a perfect match for the project.” The challenge for the construction team then became integrating the barn to look like it had always been there. “The original post and beam was resurrected so that it appears to be an old barn from the inside,” says Spang. “However, the roof is conventionally framed, allowing for spray foam to make it energy-efficient.” The team worked to maintain the original beauty and integrity of the post-and-beam timbers while essentially redesigning the barn to fit the new addition. With her passion for conservation, Missy wanted to recycle as many building materials as possible. 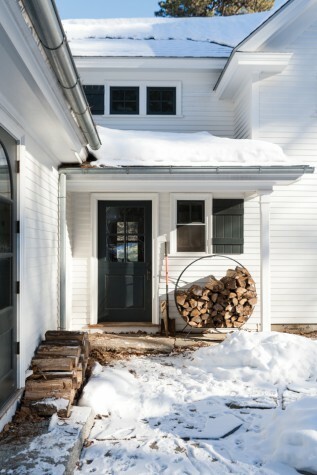 Throughout the house, Spang found ways to use recycled wood, including an old bowling floor, wood from a Machias camp site, a large slab of pine with its original bark, old doors, and an original work bench from the barn. 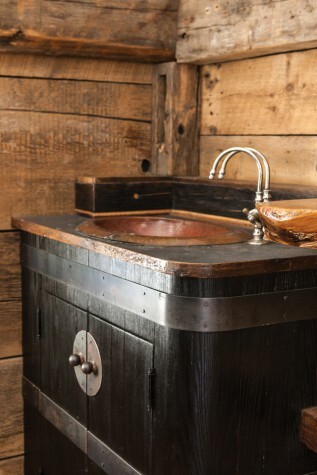 All the original floorboards from the barn were reused, even the ones with paint splattered on them from years of boat storage and maintenance. 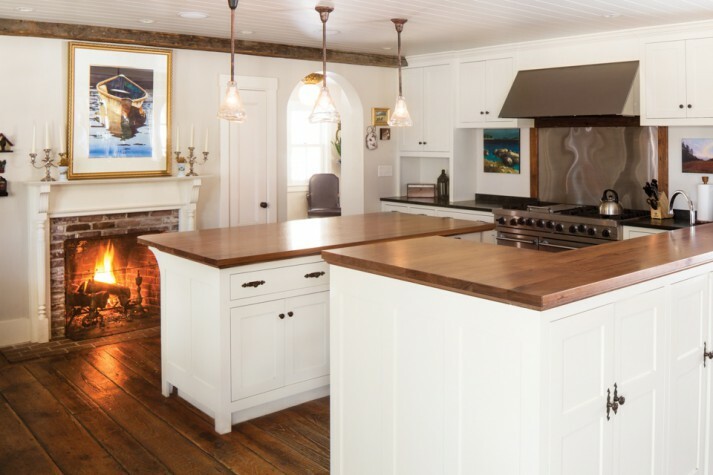 This prevalence of “old” is nicely balanced with new: stained concrete flooring in the entryway, black granite and stained mahogany counters in the kitchen, copper counters in the bar area, and galvanized counters in the laundry room. Just as the materials palette is a mix, so too is the decor. 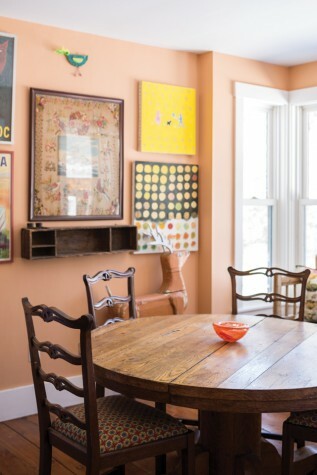 “It’s a bit of a hodgepodge,” says Missy, who credits living in London and traveling in Europe for her love of mixing old and new, things found and things created. “In Europe, old and new are symbiotic,” she says. While abroad, Missy studied furniture conservation and restoration, and learned the applied arts of gilding, finishing, veneering, and upholstering. This time of her life is given a nod in a few architectural elements in the house: a mahogany newel post found on the side of the road near where she lived in East London is now at home in a stairwell; a rose-capped water pipe she happened on while walking home from a pub one night is a support for the sink in a bathroom. 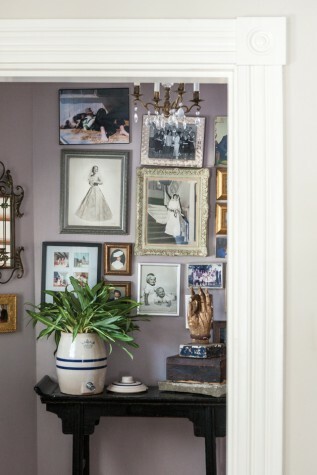 “Missy is a real ‘picker,’” says Spang, “so we often had to figure out how to duplicate or integrate an old piece she had found.” Warner echoes this: “Every time I would arrive at the house for a project meeting, all the furniture had been rearranged, with new found objects and a new aesthetic theme. It was astonishing to see how much energy she could bring to each meeting.” Indeed, the energy of the team as a whole is what makes this house such a masterpiece. Call it fate or good sportsmanship, but Warner’s appreciation for this old structure—a house he had wanted for his own family—is evident in his design. And Spang’s respect for its history is visible in the authentic way he and his team reused and repurposed materials throughout.